I don’t understand what one person could possibly do to help in this midst of this terrible church conflict! Posted in Excerpts from "Redeeming Church Conflicts"
Posted in Authentic Relationships in the Church, Biblical peacemaking in the church, Change in the Church, Excerpts from "Redeeming Church Conflicts", Reviews of "Redeeming Church Conflicts"
Every time I think about my church conflict, all I feel is hopelessness. I just don’t see anything at all to hope in! Church conflict often robs us of an accurate, hopeful, God-centered perspective. 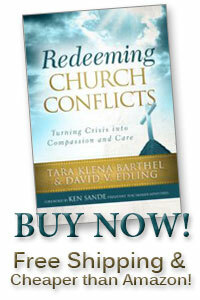 Excerpts from "Redeeming Church Conflicts"
Reviews of "Redeeming Church Conflicts"
When is it valid to leave a church? Q. OK. We’re “reconciled.” I guess. But how could we ever trust one another again? What Rules Govern Your Interactions with Others (Especially in Your Church Conflict)? Unless otherwise noted, all contents copyright 2012 Dave Edling & Tara Barthel. If you are quoting this blog, please provide a cite and link back. Thanks for this courtesy! Redeeming church conflict means intentional dependence on the humbling and heart-changing grace of Christ’s Holy Spirit by turning relational crisis in the church into compassionate care as you take every thought and deed captive to Him. This blog is designed to provide general information on theology, biblical peacemaking, and various aspects of biblical change related specifically to church conflicts. It is not intended to provide pastoral, legal, or other professional advice. Readers are encouraged to seek the counsel and oversight of their local church leaders as well as any competent professionals relevant to their life situations. Without your express permission, we will never release or sell to anyone for marketing purposes the contact / personal information we receive from you.